A primarily off-street recreational trail from the Ohio River to Lake Erie, the Ohio to Erie Trail spans the state of Ohio from Cincinnati to Cleveland for the most part following lands formerly occupied by railroads and canals. 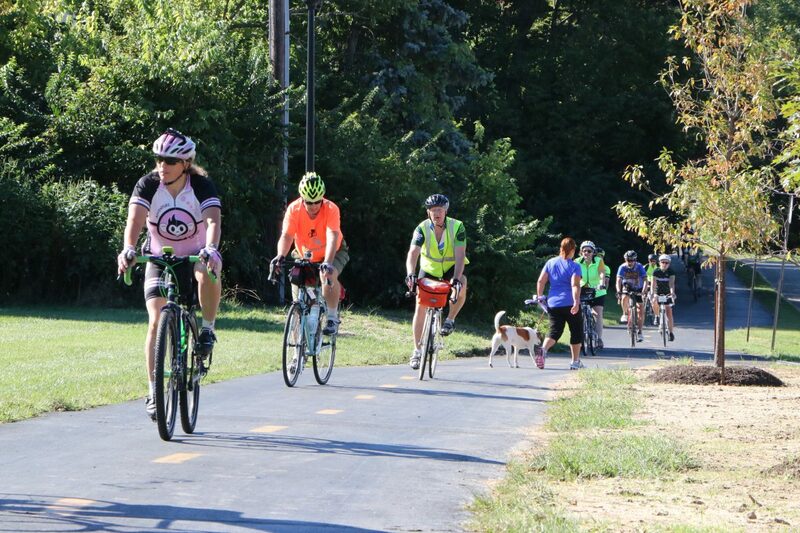 The collection of regional trails connects four of Ohio’s metropolitan cities, a dozen large towns and numerous small villages – all done on easily accessible, paved trails that are primarily separated from highways and automobiles. The entire Route 1 is complete. The total distance as of June, 2017 is 326 miles. In 2017 about 280 miles of the 326 total are on separated paved trails with about 50 miles on some city streets and rural roads. Our mileage grids help you to plan shorter or longer travels on the OTET between the towns or designated areas. The actual total mileage of separated paved trail changes monthly as more and more miles are taken off streets and routed onto new separate paved trails. In some areas we are adding more paved trail which removes the route from streets like what was done in Knox County and is being done in Holmes County. The OTET is known as Route 1 in Ohio. The 80+ large way-finding signs help travelers to know the distances between towns as well as what amenities each locale has to offer. Also, hundreds of Route 1 bike signs with arrows, mark the way between our way-finding signs. We have now added some Alternate routes designated with the same Route 1 sign but with a 4 x 6 inch ALT at the top in black and yellow. 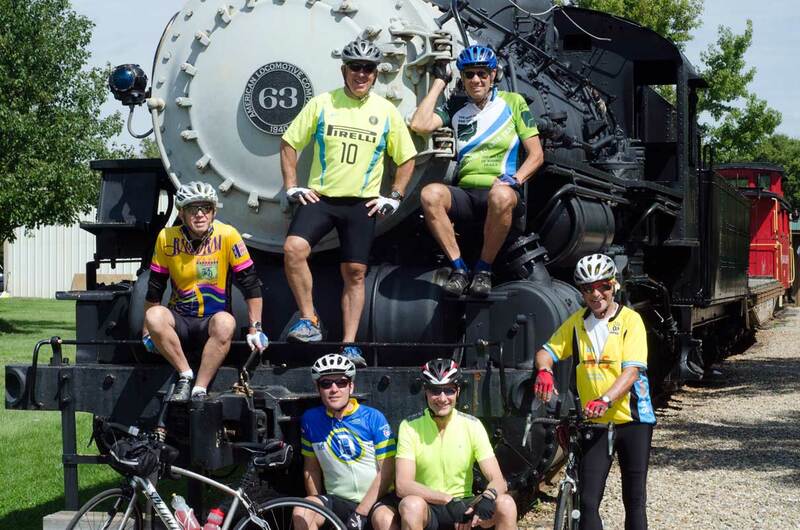 These alternate routes connect back with the nw routes and allow travelers a different experience, local sites and towns as well as some nice rural roads in Amish country that use to be part of the OTET until more rail trails were opened. Our printed Tour Guide (2017) set of four maps will guide you well on both completed pathways and connecting road segments. However, note that with new pavement added, and local detours for all kinds of reasons, make sure that you have checked this web site for updates! Tour Guide are ordered through our store for $15 plus $2 postage and tax if an Ohio resident). There are wholesale and bulk discounts. Become a Friend and receive a $5 discount on a Tour Guide. 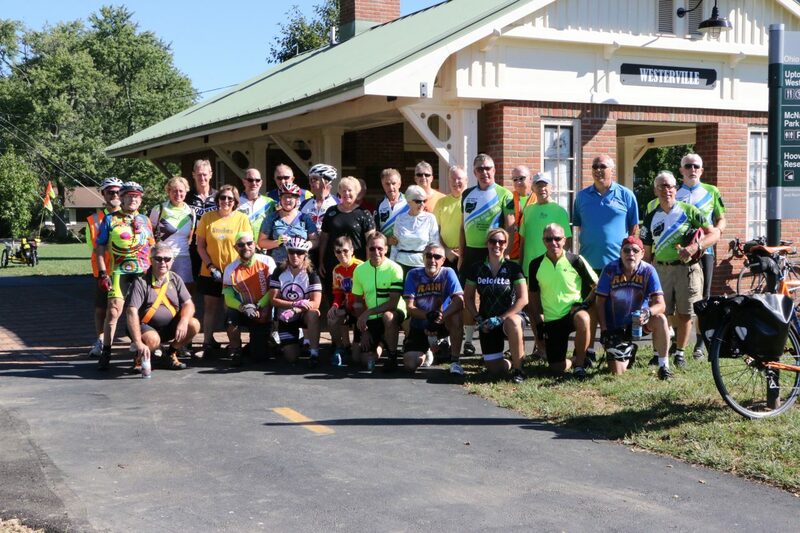 In the near future the designation of US Bike Route 21 will be appended to the Ohio to Erie Trail, signaling an exciting era of inter-state bicycling networks. The OTET will retain the Ohio Route 1 designation but will also be known nationally as US Route 21. A cross state route numbered 50 is also being designated and a section will be on the Ohio to Erie Trail. 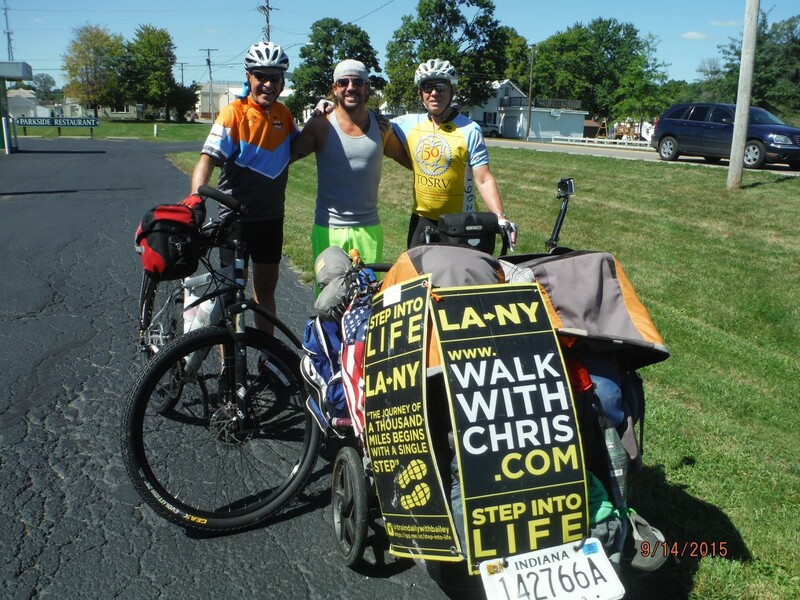 Along the way, the trail passes through rural areas, farmlands, nature preserves, Amish heritage areas and regional parks giving the adventurous a hearty helping of nature’s finest. The small rural towns are a treasure of small shops, restaurants and history of Ohio. At the metropolitan perimeters, meadows and woods give way to exciting urban centers, affording the traveler a contemporary taste of Ohio’s culture and arts. There are visitor centers, museums, parks and displays all along the OTET. The Ohio to Erie Trail is a collection of multi-use trails that provide exercise and adventure to anyone who’s willing to leave the automobile behind. Bicyclists, equestrians, skaters, hikers, wheelchairers, families with strollers, bird watchers, walkers and nature lovers are a common sight. In the winter, the trail becomes a snowshoe and cross-country ski path. And, for those with mobility impairments, construction designs have made sure we are in full compliance with ADA guidelines so that everyone has the opportunity to explore the natural beauty of Ohio as the trail weaves its way across the state. Find an issue, e-mail us please. The Ohio to Erie Trail is in place with 280+ miles of recreational trail. Users are able to travel the corridor linking Cincinnati, Columbus, Akron and Cleveland on a safe trail while enjoying the splendor of Ohio’s rural heartland. Along the way, users can re-live the history that shaped the state: Amish history, Revolutionary War history, Civil War history, canal history, railroad history — it all happened here along the OTET! Travelers can traverse the entire 326 miles of Route 1 from Cincinnati to Cleveland now using the 280+ miles of paved trail separated from streets. In the metropolitan areas there are still a few miles of travel required on streets. In the rural areas of Holmes and Wayne Counties there are a few miles of country roads as we work to acquire and also pave property for the OTET recreational trail. Wayne County has the largest section of very rural roads used on the OTET and has 17 miles remaining to be turned into recreational trail. Alternate Routes Available – In the summer of 2017 as more rail trails open and the street routes are reduced, the OTET Fund Board has decided to keep some of the very scenic street routes as Alternates paths on the OTET. The same Bicycle 1 signs will be on those routes but are now marked with bright Yellow on Black ALT Stickers. The ALT routes will bring Trail users right back to the main route. There are 22 local/regional trails that come together to form the Ohio to Erie Trail. Each of the trails has its own unique aspects and each varies in length with the Little Miami Scenic Trail in southern Ohio and the Ohio & Erie Canal Towpath being the two largest with about 50 and 100 miles respectively. Sometimes we get questions about the signage of Bicycle 1/3 from Xenia to Avoca Park/Newtown in the southern region. The 1 stands for the OTET and the 3 stands for the Little Miami Scenic Trail which does go north from Xenia and on to Springfield along the Little Miami River. So that this long standing trail route does not lose its identity, we have a shared numbering on the sign for the 50 miles that they overlap, just like state routes and even some interstates where dual numbers are not uncommon. Currently 8-2017) Bike Route 3, the Little Miami Trail, heads south at Newtown Road while the OTET, Route 1, heads west through Mariemont and Fairfax and into Cincinnati. In the future, OTET will follow Route 3 to Beechmont Levy and on to Lunken Aiport Trail and into the city, eliminating Mariemnont and Fairfax city streets. A bridge across the Little Miami River at Beechmont Levy is required for this to happen. Every week there are numerous events all along the OTET from local community walks to more ambitious fundraisers that have runners, walkers and bicyclists traveling many trail miles to raise funds for great causes. Note that some local communities may have regulations regarding use of the trail for such events. The OTET Board of Directors strongly suggests that event organizers check with local trail stakeholders to avoid conflicts.